JUNIOR RESERVE OFFICER TRAINING CORPS (JROTC) INSTRUCTOR PAY. 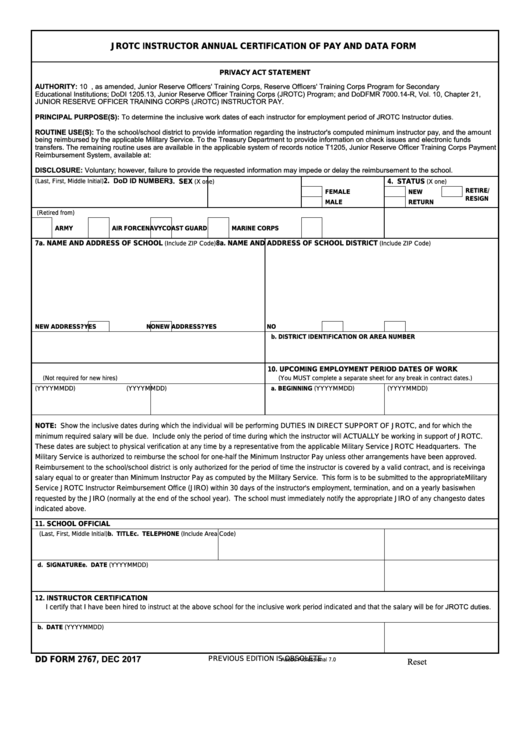 PRINCIPAL PURPOSE(S): To determine the inclusive work dates of each instructor for employment period of JROTC Instructor duties. DISCLOSURE: Voluntary; however, failure to provide the requested information may impede or delay the reimbursement to the school. minimum required salary will be due. Include only the period of time during which the instructor will ACTUALLY be working in support of JROTC. Military Service is authorized to reimburse the school for one-half the Minimum Instructor Pay unless other arrangements have been approved. I certify that I have been hired to instruct at the above school for the inclusive work period indicated and that the salary will be for JROTC duties.